My name’s Fred, I’m nearly 8 years old. 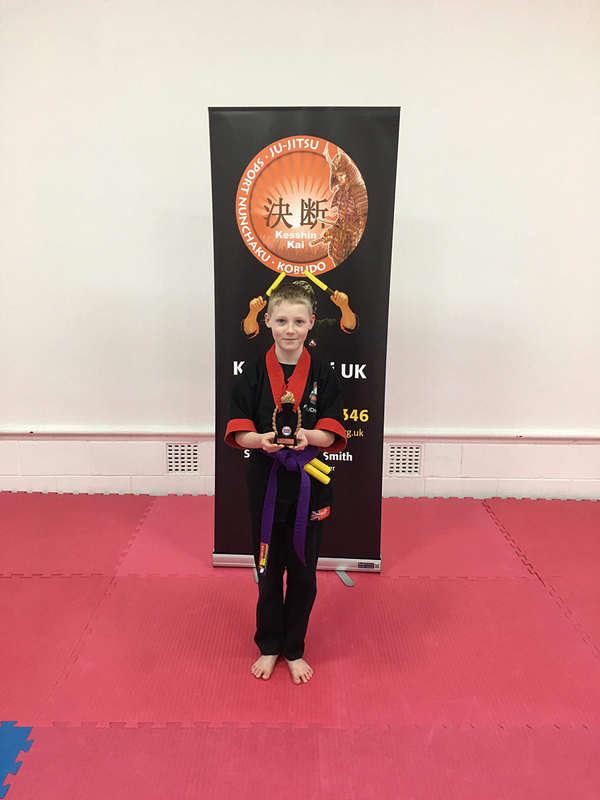 I go to Ghyllside School in Kendal, and I’ve been a member of the Kendal Sport Nunchaku UK club since I was 4 and half years old. I’m currently the UK National Champion (7-9 age group) having won gold in Liverpool on May 17th 2015. It was a tough competition – I had nine fights and won them all – the final was live on Twitter too so my Mum could watch from home while she was looking after my baby brother! Previously I’ve won a medal in all but one of the regional competitions I’ve entered, and have 4 golds, a silver, and 2 bronzes. I’m really proud to have achieved so much already. My favourite competition was the European Nunchaku Championships in Vevey, Switzerland where I got to travel with Sensei Smith and the rest of Team GB in 2014. I got 5th place in my age group and it was a great learning experience for me. We trained hard in Vevey, but we also had a lot of fun – laser-quest, sightseeing and exploring. Vevey was a beautiful area; a bit like the Lake District really. Being able to travel to other places to compete is a fantastic experience. Now I’m preparing for the World Nunchaku Championships taking place in Kendal on June 20th and 21st 2015. I’m really looking forward to it as I’ll be entering the freestyle competition as well as fighting. I hope I can get a medal this time. Since my first lesson I’ve loved doing Nunchaku. There’s so much to learn, and I’m learning from the best – Sensei Smith! It’s challenging to remember all the different techniques (Freestyle, Kata, Combat) but it’s cool when I’ve learnt them. I take it all seriously but the club is a fun place to be. Everyone is friendly and we get on well. I can’t wait for summer school to start so I can continue to learn new things but also go skiing and go-carting! I started practising sport nunchaku over 3 years ago with Sensei Smith and still can’t wait for the next class to start. We do a mixture of things in the class including: pad work, free sparring, application, combat, kata and last of all one of my favourite parts ‘Tricks’. Now my younger brother has joined the club too and we have lots of fun together. My Dad is also a club referee so the club is definitely part of our family! Thanks to my Dad for helping me write this article!